Across the West, and in the Wyoming economy non-labor income is large and growing. View the interactive graph from Headwaters Economics. As an economist who loves the West and our open spaces, I think a lot about what makes our small towns tick. To better understand how our economies work and how to strengthen them, we first have to ask where our money comes from. The answer—non-labor income—might surprise many readers. You may be asking, “Non-labor what?” Non-labor income includes things like investment and retirement income, and medical or economic hardship payments. Headwaters Economics recently released an in-depth study of non-labor income across the West to better understand how it affects communities. In Wyoming, income from non-labor sources is more than twice the personal income from people working in farming, forestry, mining, and oil and gas extraction combined. 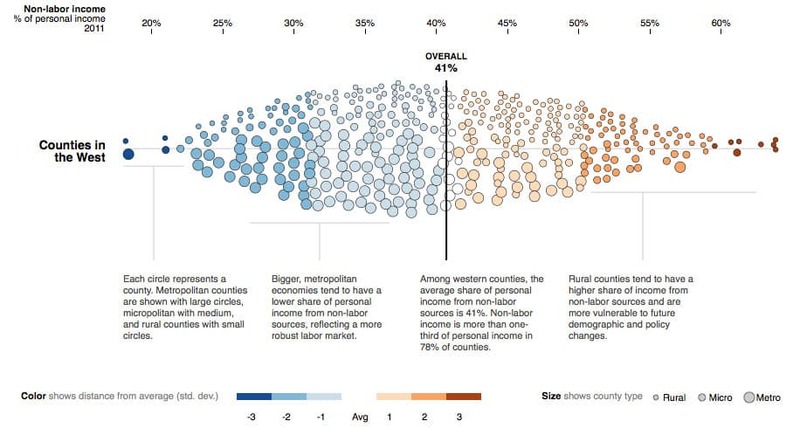 Across the West, 41 percent of all personal income came from non-labor in 2011. It also is growing fast: since 2000, 60 cents of every new dollar of income in the West came from non-labor sources. With smaller, less diverse economies, rural communities are particularly dependent on non-labor income. This is important for several reasons. First, we cannot take steps to maintain our economic drivers if we do not know what they are. Second, not all counties with high non-labor payments are doing well. Some are booming, while others are struggling, which is related to the primary type of non-labor income in the community. And third, the amount of non-labor income will change along with the stock market, demographic trends, and federal policies. There are three types of non-labor income: income from investments (including the stock market), payments associated with aging such as Social Security and Medicare, and payments due to economic hardship, such as welfare and Medicaid. Counties with a high share of investment income tend to have lower poverty and unemployment. More than fifty western counties receive at least a quarter of their total income from investments, many of which are resort destinations such as Teton County, Wyoming. Counties with investment wealth often see growth in many parts of the economy, including health care and real estate. Those counties with larger percentages of income from age-related payments include retirement destination communities, but more often they are less well-off rural counties where the mine or lumber mill closed, working-age people left to find jobs elsewhere, and many remaining residents are retirees. The health care sector supporting this aging population is often the biggest employer. Higher payments due to economic hardship in counties coincide with persistent poverty, such as former mill towns and Indian reservations. Across the West, one in every five communities receives 10 percent or more of its total income from hardship payments. In these communities, the health care sector is large and provides well-paying jobs crucial for residents. As the baby boom generation retires, it will bring an influx of income from Medicare and Social Security. However, these benefits, as well as hardship payments like Medicaid, are regularly reevaluated, and it is difficult to predict whether future payment amounts will increase or decrease. Reductions to health care-related programs would affect what is the biggest employer in many of these communities. This would create a cascade of effects from those receiving the benefits, to those working in health care, to businesses where these employees spend their money. In large, diverse economies, cuts to these payments would be diffused. But in communities with little other economic activity, the effect could be significant. Today, many small communities across the West are unaware of the importance of non-labor income. Changes to these payments will affect all of us, particularly the rural communities that are fighting economic and population decline. As non-labor income shifts, those communities that understand and respond to these changes will be better situated to perform well and benefit in tomorrow’s economy. 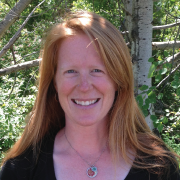 — Megan Lawson, PhD, is an economist with Headwaters Economics in Montana. — Columns are the signed perspective of the author, and do not necessarily reflect the views of WyoFile’s staff, board of directors or its supporters. WyoFile welcomes guest columns and op-ed pieces from all points of view. If you’d like to write a guest column for WyoFile, please contact WyoFile editor-in-chief Dustin Bleizeffer at dustin@wyofile.com. REPUBLISH THIS COLUMN: For details on how you can republish this column or other WyoFile content for free, click here. If you enjoyed this post and would like to see more quality Wyoming journalism, please consider supporting WyoFile: a non-partisan, non-profit news organization dedicated to in-depth reporting on Wyoming’s people, places and policy. Megan, really great information and a bit scary. Thank you. As a follow up, It think it would be really interesting to break down Non-labor payments. Retirement income and income from investments, is different than health care, welfare, and other subsidies. ALEC Mead owns the state, just the way they like it, keep the population dependent, they are easier to control and will work for food.